Happy April! The time always goes by so fast. 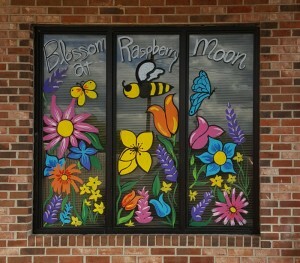 Have you seen our fun new window design? Thanks to Jaidra with Niad for the lovely work. Be sure to check out and like her page. She has all sorts of fun art classes going on, has lovely items for sale and does henna. She can even do a henna party! So get some girls (or guys) together and have some fun. These parties are perfect for baby showers, birthday parties, girls night out and whenever else you need a little fun! 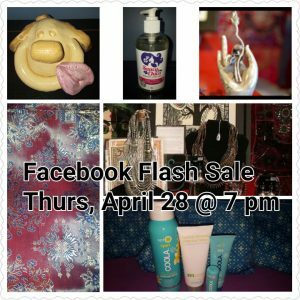 Mark your calendars for the next Flash Sale on Thursday, April 28 @ 7pm. Just in time to recoup from the end of Tax season, pick Mom up something nice for Mother’s Day and to celebrate my Shoopy. He was born April 11, 1928. I decided we would have 28 items on the 28th in his memory. How this works: I will post a picture and description on our Facebook page every few minutes and the first person to say IT’S MINE! wins the item. All items must be paid for and picked up by Friday, May 6th. If the first person doesn’t pick up their item by Friday then the next person wins the item. These are the bomb and the perfect Glamorous Extra to an Over the Moon Facial! I have about 6 different ones, sometimes more. Coffee Espresso Reaffirming Peel Off Mask has been enriched with green coffee from Colombia and gives a lovely clearness to the skin. Its firming and anti-oxidant benefits will hydrate and tighten the facial skin. Coffee has strong antioxidizing properties to slow down aging and damage due to free radicals. Soothing and softening sweet almond oil and allantoin give the skin a silky touch. 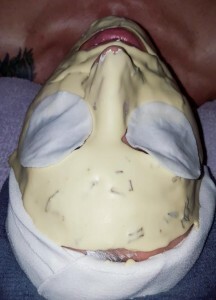 Collagen Peel Off Mask brings new life to your skin. Infuses the skin with moisture, improving elasticity and firmness which helps to reduce the formation and appearance of wrinkles. Stimulates capillary blood circulation, leaving the skin with a fresh appearance. Algovert and natural clay combine to bind facial hydration, leading to elasticity. Cranberry AHA is a Botox-like Peel Off gently exfoliates and hydrates the skin. Fruit acids are effective in the removal of the dead cells and plays a significant role in the cell renewal process. Fruit acids moisturize the skin making it looking fresher and more supple. Fine lines and wrinkles lessen. Imperfections and brown spots fade away over time and the complexion gets radiant. Wheat ceramides, having a strong water-binding capacity, provide smoothness. Vitamin C Peel Off Mask fights radical reactions and aids in collagen synthesis. Skin is revitalized and regains its glow. Vitamin C is moisturizing and will help to improve elasticity and suppleness. Brown laminary algae (seaweed) add minerals and trace elements to the tissues. Pumpkin Peel Off Mask is a rich source of antioxidants and enzymes that act like Alpha-Hydroxy Acids. Pumpkin also contains more than 100 beneficial nutrients, which may be used to help reverse the signs of aging. Alpha-Hydroxy Acids have been shown to promote smoother, younger looking skin by increasing the rate of cell renewal. Whitening Peel Off Mask is intended for all colors and contains no hydroquinone, which is known to have irritant effects. The anti-oxidant activity neutralizes free radicals and slows skin ageing. The mask inhibits melanin formation, preventing the skin from turning dark in the sunlight. It has a strong moisturizing and firming power. As you can see, there is a face mask that will suit your skin type! These masks take a little longer and cost a little more. Add an Intense Therapy Mask to your next facial for $15. The networking group that I’m a part of has some really neat topics coming up. We don’t have all the details firmed up for the Wildflower Walk or the Mushroom Tour, so Like the WSBG Facebook page for all the latest info! We generally meet the second Wednesday of each month. Meetings and membership are free unless otherwise specified (besides the cost of your lunch). April 13th, 12 – 1:30pm at Earthfare on Pelham Road – Angela Fitch of At Your Beck & Call will give us an overview of the book The Life Changing Magic of Tidying Up and the KonMari Method just in time for Spring. She’ll lead us in a discussion of how best to implement this “life-changing magic” so we can all surround ourselves with more joy in our homes and lives. RSVP on Facebook. May 23rd, exact time and location TBD – Wildflower Walk. My friend Jaidra will be leading us on a walk in the woods identifying wildflowers. We’re still ironing out the details so stay tuned to Facebook for more info. June 13th (tentative) – Tour of Mushroom Mountain in Easley. I can’t wait to see this place! Again, check Facebook for all the details. Sandal Season is here! Have your feet been neglected over the winter? Well it is time to remedy that and get them baby smooth! Purchase a pair of Spread’ems Pedicure/Yoga Sandals for $36 and get 50% off our new TigerLily Foot Peel – save $12.50! Tigerlily Summer feet foot peel is an amazing, simple way to remove all the dead skin and calluses from your feet. Did you know you have more dead skin cells on your feet than anywhere else on your body? Simply put on the booties and relax for one hour. After one hour, remove the plastic booties and wash feet with soap and water. The dead skin cells will begin to peel about 3-7 days after initial application. You will be amazed at the results and your feet will be perfect for summer (sandal season) or anytime! Don’t have time to do this treatment at home? Through the month of April, you can add it to any Facial for just the cost of the Peel – $25 (normally a $35 add on). *Just as a side note, the peeling process on your feet could take up to 14 days. Do not remove skin forcibly! The peeling will begin around day 3 and could last up to 7 days. So please plan accordingly. There are 2 reasons why Yoga Sandals® are fabulous! The first being they are perfect sandals to wear for pedicures. You toes are separated so you just put these on right before the polish and you can walk out the door right away. No more messed up polish, smudges or waiting around for them to dry! The 2nd reason is they are good for your feet! A young foot is agile and toes are evenly spread. As we grow, years of cramming feet in to unsuitable, narrow shoes begins to take its toll. Feet lose their young, agile shape and flexibility and when we walk the bones of our feet jam together. As a result, our natural balance and body alignment is lost. Without mobility in the bones of our feet several foot disorders such as Osteo-Arthritis, hammer toes, bunions and poor circulation can occur. Yoga Sandals® work to alleviate these potential problems by spreading the toes and retraining the feet. As the foot bones regain mobility, balance and body alignment are restored and over all wellness is increased. I am on my 2nd pair! The first pair I had for about 8-10 years I think. I somehow lost them in the move so had to buy another pair. PS- Once you have your feet all nice and pretty, give Jaidra a call and get a little henna work done to show off those feet!